The Basturs Poble site is what is known in English as a bone bed, a geological stratum containing a great amount of fossils. The stratum dates back some 70 million years. It is the only one to have been found in Europe exclusively containing hadrosaur remains. The excavations conducted during the past ten years have yielded approximately one thousand fossils. The remains are disjointed and possibly belong to only one species: the Pararhabdodon isonensis. "We think the individuals died due to unfavourable environmental conditions, perhaps an extreme dry spell. 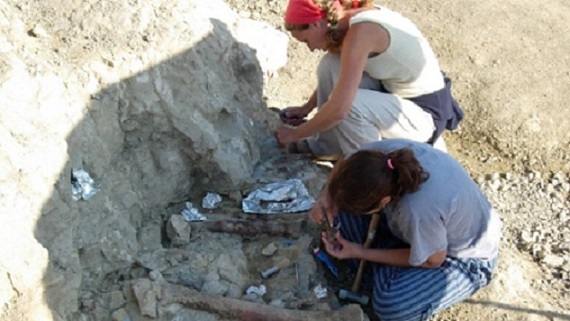 After their death, the remains got washed away by water and then began to fossilise, but we know that the place where they died was not far away from the site", explains Víctor Fondevilla, researcher at the Institut Català de Paleontologia Miquel Crusafont (ICP) and the Universitat Autònoma de Barcelona (UAB) and first author of the paper. The Pararhabdodon isonensis species is only known to have existed in the Pallars Jussà region. The species was described in 1985 after the discovery of remains found at Sant Romà d'Abella and its specific name - isonensis - refers to the town of Isona located near the site. These dinosaurs measured from 6 to 7 metres in length and it is estimated that the adults weighed some three tonnes.